Studio 5380: Make today ridiculously Amazing! Hello everyone and welcome to Studio 5380! This is one of those bright, happy, fun cards that just makes me smile! The papers for my card base are from the Dear Lizzy Neapolitan Stack - I love the colors! I did a bit of inking and then some machine stitching around the edges of my mats. Next I used a few pop dots to adhere the top layer onto the striped layer. 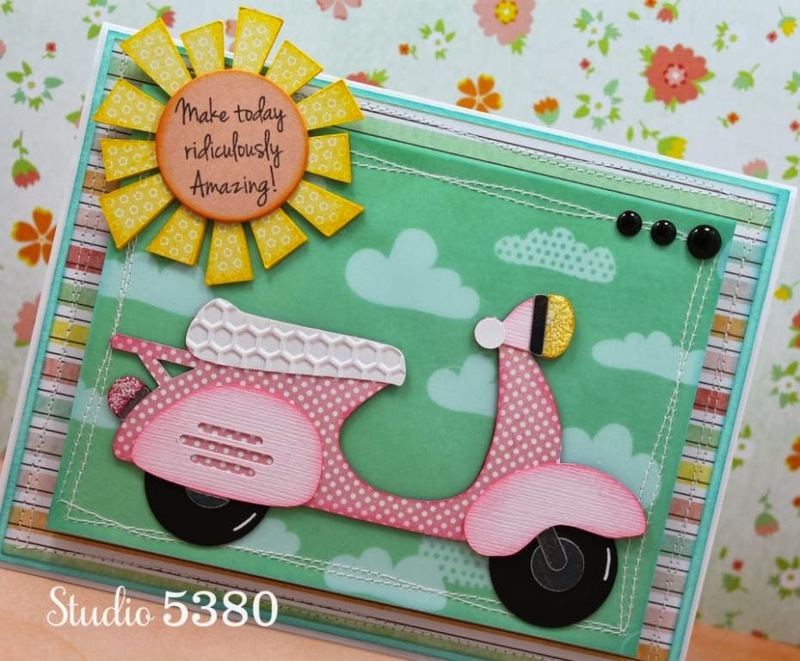 The adorable little scooter is from Pretty Paper, Pretty Ribbons. I used a "Honeycomb" embossing folder for the seat of the scooter and added some Stickles to the lights. The sunshine is an SVG file from the Silhouette Online Store. I really didn't like the center portion of this file so I used the circle die from the Tiny Doilies Die Set. It was the perfect size for my sunshine and fun sentiment. The sentiment is from the new stamp set Simply Sentiments. And of course I had to "pretty up" the inside of my card! 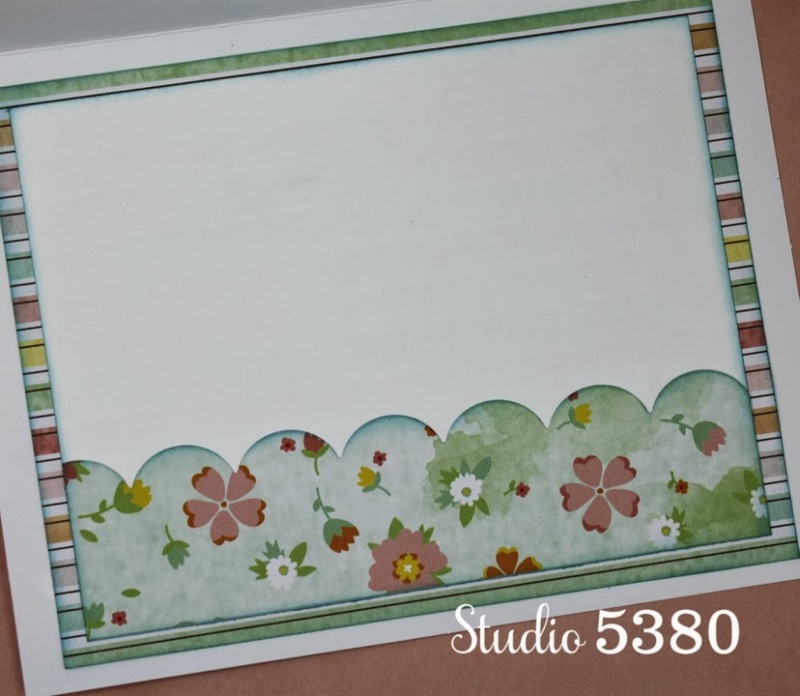 This pretty, scalloped border was created with the Fancy Edges metal die set. This fun card is going to a special little girl named Maddy. Maddy is a 6 year old cutie pie who is dealing with Leukemia. You can read all about Maddy and how you can send a card to help brighten her day at I Feel The Love Project. That's it for me today. I hope you have a wonderful day! I love this card! I love the papers, the colors, the dies, the sentiment, the sewing.... I love it all! What a happy card. Hugs! This Is just darling!! Sweet sentiment!! Awesome love the new design! Great project!!!! What a super adorable card Tanya! I just LOVE that scooter and the fun pattern papers! Super cute! I want to use this scooter too, but you made it look amazing already! Cute, cute! I love this scooter. Your details made it even cuter. Tanya ~ SUPER ADORABLE!! Oh I LOVE that scooter and your whole scene! LOVE how you embossed the seat!! Too FABULOUS as always! Fabulous card and design! The little scene you created looks awesome! Tanya, what an adorable card. You are right, it is one of those cards that just makes you smile!! Thank you for sharing this card with the I Feel the Love Project. We really appreciate it. Many blessings to you. So cute Tanya. 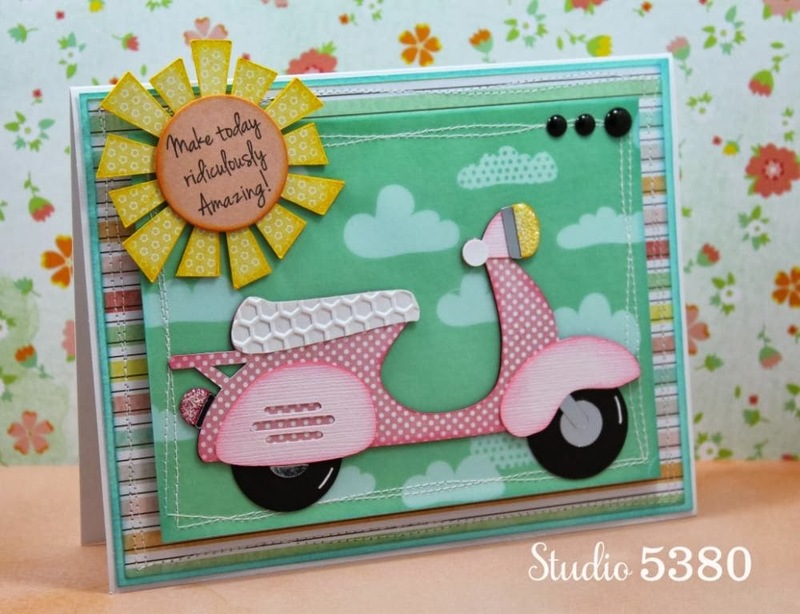 I love the fun spring colors and the embossing. MCS Release Party Blog Hop Winner!